Vizify, a social tool for creating a great first impression online and a recent grad of TechStars‘ Seattle accelerator program, is announcing today that it has raised $1.2 million in seed funding from a group of entrepreneurs and investors, which includes Picnik Founder Jonathan Sposato, Founder and Managing Director of Draper Fisher Jurvetson, Tim Draper, Bill McAleer of Voyager Capital, and Co-founder of Feedburner Matt Shobe, among others. Vizify is also a member of the inaugural class of the Portland Seed Fund, a seed fund and 90-day accelerator program that invests $25,000 in six to eight Oregonian companies every six months. So what is it about Vizify that has attracted this sizable round of seed investment? The startup, which is currently in private beta, wants to take that ever-growing wealth of information about you that is already available online and construct a unified and visual profile to help you, what else? Make a good first impression. The goal, then, is to help average web users build and manage their personal, online brands, as well as to help people seek out new business or employment. Co-founder and CEO Todd Silverstein says that the company is using a variety of data-based techniques to help identify and communicate what makes you, as an an individual, “awesome” — based on the content, profiles, and information you’ve created (and continue to create) each day online. 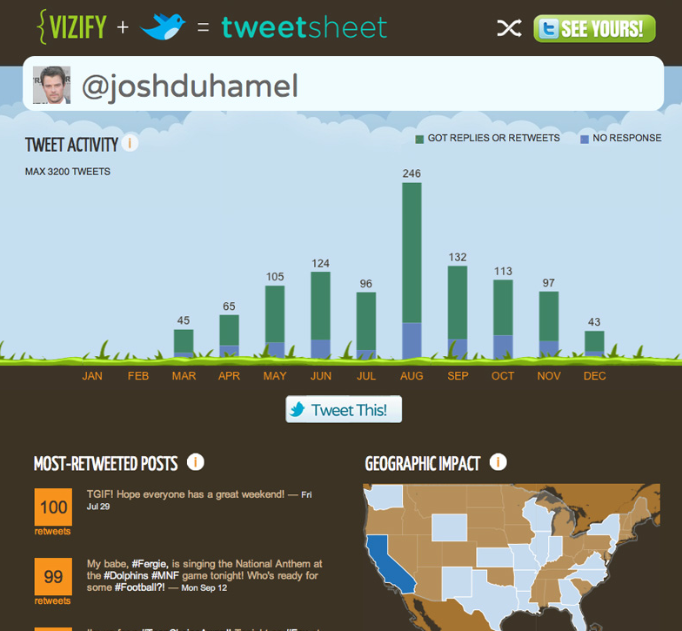 Although we’ll have to wait until Vizify launches later this year to see the nuts and bolts of what this means — in practice — the startup is already offering its “TweetSheet”, which creates an instant infographic out of your Twitter activity, highlighting things like your top followers, geographic impact, and your most viral content. This is by no means the main focus of what Vizify will be doing, but it is a small demonstration of what it can do with the information that piles up from your everyday usage of sites like Twitter. Vizify thinks that this information is underutilized, and while Twitter users may not care particularly about analytics, it can still help brands and regular tweeters see who their top followers are, or what their top tweets were. What’s most interesting to Vizify, Silverstein says, is the social function of this information, where it gets shared and talked about, and the company wants to help users make use of this information on their favorite sites. Thus, the need for a service like Vizify comes from the three trends: The amount of information people share online is doubling every year and much of that is automated (like Spotify plays showing up in your Facebook Timeline); second, the mainstream is waking up to how much information is available about you online in a simple Google search, thanks to APIs and innerconnectivity that pushes that information (or makes it available) in more than one place at once; and third, the challenge of managing your identity online, across multiple silos, contexts, etc. We all have our profiles, or at least some amount of personal information, across sites like Facebook, Twitter, LinkedIn, Google+, and one thousand others. As we see Facebook pushing its Timeline, and G+ pushing circles, finding better ways to manage and share your life and personal information online is coming increasingly to the fore. About.me is a good, quick way to aggregate your basic personal information in one profile, but Vizify wants to create a more sustainable and useful way for people to get back in control of their personal information, again, centered around what Silverstein says is the digital equivalent of real world first impressions. This will likely take shape in a suped-up and more interactive About.me presence, that aggregates your profiles in one place, allows you to control them from there, and offers a host of visual, data-based tools (like the TweetSheet) to help you get more from your social media experiences. It’s an interesting idea, one that’s been tried in a number of different capacities already, but we’re looking forward to seeing what Vizify has in store when it peels back the curtain. If there’s enough appeal in the data-parsing tools, it’s easy to use, and visually engaging, Vizify could be onto something here. Stay tuned for more.